Another month has passed, and over that time there has been various additions to the VioVet catalogue to suit dog, cat, horse and small animal owners. Royal Canin has brought out its new Urban Life range of dog foods. For cat owners we have a ear cleansing solution from Vetruus. 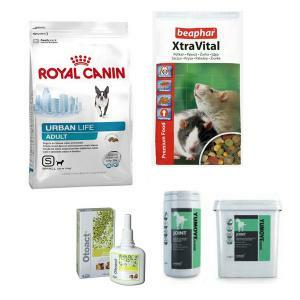 Lintbells have added new supplements to their popular supplement range to provide for hooves, joints, skin and coat, and for the small pet owner, we have added the XtraVital Rat Food from Beaphar. Urban Life is the new range from Royal Canin which helps to provide extra support for dogs that reside in an urban environment. Aimed at those that experience large crowds, noisy public places and pollution from heavy traffic, each diet has been formulated with select antioxidants and nutrients to ensure your dog receives all it needs to give it the best possible lifestyle when living around these common factors which are especially prevalent in town and city centres. The Urban Life range has been split into Junior, Adult and Senior diets which each contain extra support for the dog at its stage of life. The Junior diet has nutrients for proper growth as well as prebiotics to aid their natural defences. The Adult diet has the perfect calorie content to keep your dog fit and healthy, with nutrients to support healthy joint and brain function. The Senior diet has enhanced nutrients to help your dog age healthily whilst supporting normal renal health. Each diet is available in both wet and dry varieties, and for a limited time you can purchase selected dry diets and receive the wet diet free. Otoact Ear Cleansing Solution has been produced by Vetruus to enable the pet owner to maintain good ear hygiene for their cat without the need to take them to the vet each time. Otoact is used to gently dissolve excess cerumen which can keep the animal's ear canal free from wax build up. Otoact can also be used on dogs. Lintbells have been very successful with their range of Yumove Joint products for dogs and cats. Well now you have the chance to provide your horse with an exceptional joint supplement as they have now released Yumove Horse Joint. It contains a unique combination of proven ingredients to support mobility, joint structure and help soothe stiff joints. There is also a Active Joint variety to provide extra support for performance horses. Not only can your horse's joint benefit from joint support, but now Lintbells has also released products in their Yumega range to supplement your horse's skin and coat, as well as Horse Hoof to provide your horses with high purity ingredients to aid in healthy hooves. Beaphar is a family-owned company which has been producing high quality, cost effective animal products for over 70 years. They have recently made available a new XtraVital Rat food, which comes as a muesli-style feed which is supplied in gas-flushed bags to ensure maximum palatability and freshness. It has been formulated with the rat in mind, using just the right amount of fibre, animal protein, minerals and vitamins. Beaphar small animal food has been very popular with our customers in the past and we are sure this new food will continue to prove the trend.